Digital Home Thoughts: I Build My Own Computers at Home! I Build My Own Computers at Home! "In recent years, building your own computer has become more of a niche technophile activity than it was in the earlier part of the decade. Few people see the benefits of expending the effort to figure out how all the different components of a PC fit, screw, and plug together when you can just as easily fill out a customization form at any number of online retailers and have your own custom build arrive in just a matter of weeks." For those of you who are looking to get your Geek on, putting together your own computer can be a worthwhile activity. Laptops, while technically can be Do-it-Yourself, is much more difficult as your options and suppliers are limited. However, the good ole desktop is an easy project and you can have your own computer put together in minutes, though more likely, hours. It is still leagues easier to put one together these days than in those of the past, but a lot of attention to detail has to be taken care of to make sure you get compatible parts. 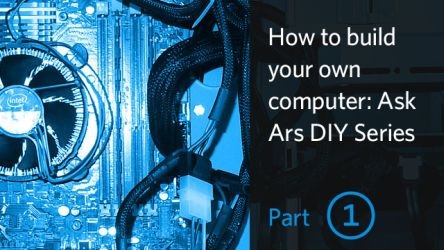 Ars' guide is a good primer, and you can spend hours or days pouring over the specifications of the CPU, motherboard, memory and every other part to your heart's delight to come up with the perfect computer. When it is all said and done though, there is a great sense of accomplishment in knowing that your baby was put together by you alone!